The mindsets, patterns and methods we have become so familiar with through the years are about to drastically change. The kingdom of heaven is going to invade the kingdoms of the world and the Church of the future is going to look very different than the Church of the past…. I saw the water level rising so fast in the basement of the church that I had to grab others to get out. It came pouring in from the bottom floor, a wall of water that was rising up from the earth, moving at a speed that was unnatural. It came up the steps and we had to quickly leave the building before going under. I had been in the LIBRARY studying my journals and books and had to leave them behind. As soon as I got outside, I saw all the people from the Church gathered together to the side of the building. They were standing on a small hill to my left on a huge ROCK. The entire hillside was one big rock that they were standing on – looking up. Something had caught their attention and they were looking together at what was taking place. Something was coming, something was shifting, and they were watching and waiting. As I look back to the church behind me, I hear something. Then I see the large brick building starting to shift. As the water now begins to pour out from beneath, one entire section to the right of the building collapses (where the Library was). As soon as it collapsed, the middle section next to it also caved in from the crumbling foundation. Then, the third and final section to the left of the tall brick building fell as the earth gave way. In a matter of seconds, the entire structure was now gone. The Lord is showing us what is to come from heaven’s perspective. This is not a crisis, but an answer to prayer! This is not a problem, but a promise! There is no need for fear or worry, for the kingdom of heaven is coming to invade the kingdoms of the earth and all that is temporal, seen and bound to the earth is going to crumble and MAKE ROOM for the kingdom of God to manifest. Believers are being called to stand on The Rock of our salvation. This Rock is not inside a church building! The Rock is a Person who loves to take people outside their comfort zones and into broad places where He can move and reveal Himself. We are called to stand together – not just inside the walls of our weekly gathering places, but to stand together OUTSIDE our structures and programs to stand with others in our community. The Church is not a building, but a PEOPLE. As we stand together, our eyes need to be focused on what is UNSEEN, not on what is seen. We are to fix our eyes on Jesus and the kingdom of heaven to know what lies ahead. Are we watching together? Are we listening together? Are we STANDING together? The water that is rising is the presence of the God and the working of the Holy Spirit to cleanse, renew and restore. The power of the Holy Spirit has been working at the FOUNDATIONS of people’s lives and the underlying motives, thoughts and intentions of people’s hearts to transform them into kingdom mindsets. The Lord has been transforming the church from the bottom up. All that has been built on man’s efforts and ideas is giving way to something greater. All that is of the earth, short-lived and lacking power, is giving way to that which is eternal and everlasting. It is causing the man-made walls of achievement, pride, and reputation to FALL and COLLAPSE. The LIBARARY represents those things we have held onto from our past that have become idols. This will be the first thing to go! Even our own stories and memories that we try to hold onto can keep us tied to this realm and limit our ability to receive fresh revelation about HIS WORLD and HIS STORY. He is challenging us to LET GO of that which we are trying to hang onto in order to receive a fresh impartation of HIS WORDS and HIS PLANS that were laid before time even began. He has scrolls in heaven written with our story, our destiny, and our purpose that have been held for these days (Psalm 139:16). He has books already written with every day of our life etched by heaven’s pen, waiting to be fulfilled. The coming FLOOD of His Presence will make room for these stories – HIS STORIES – to be read, told, and manifested on the earth through us, his sons and daughters. Rejoice in the floods that are coming! 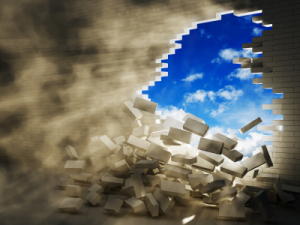 Rejoice in the walls that are crumbling! Rejoice in THE ROCK of our salvation, for He is MAKING ROOM for a new HABITATION and dwelling place of His Presence that cannot be contained in any one building! It will not look like anything we have known before. We will HEAR IT before we SEE it. Listen for the sound. Listen for the sound of praises breaking forth like many waters! Look up believer! Look up and watch – listen – for the coming of the Lord. Do not wait to GO UP – for He is COMING DOWN! Heaven is coming to earth and the glory of God will be revealed as HIS STORY unfolds before us.